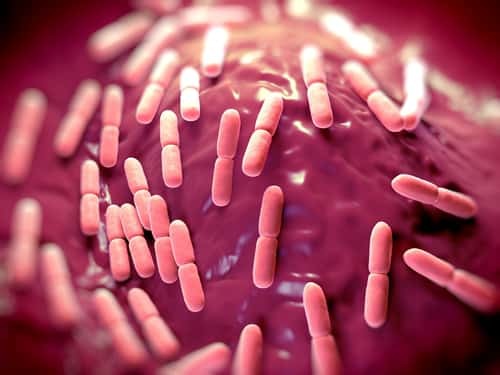 Lactobacillus mucosae is naturally found in the gastrointestinal tract of humans and other animals. Past researchers have studied this probiotic bacteria under various environmental conditions, and in competition with other bacteria. Pajarillo et al. explain that while this research is helpful to answer specific questions, the stand-alone data produced by these studies are limited and don’t provide a complete picture of protein expression.1 Recently, this research team used ultra high-pressure liquid chromatography with tandem mass spectrometry (UHPLC-MS/MS) to learn more about the L. mucosae global protein expression and metabolism under normal conditions. The researchers isolated L. mucosae from the intestines of a piglet and grew cells in MRS broth at 37℃ into the early stationary phase until the viable cell count was approximately 1.0–1.5×108 colony-forming units/mL. They harvested cells by centrifugation and washed and redissolved the cells in lysis buffer. They used the Pierce Protease Inhibitor (Thermo Scientific) to supplement cells. The team prepared seven biological replicate colony-forming units for sonication, protein extraction and proteome analysis. After sonication, they cleared crude lysates by centrifugation at 10,000 g for 20 minutes at 4℃. They used a Bradford protein assay to determine the protein concentrations. In preparation for analysis, the team performed an in-solution typsin digestion. Following this, they used a UHPLC Dionex UltiMate 3000 (Thermo Scientific) to separate peptides. To analyze proteins, Pajarillo and colleagues used a Q Exactive Hybrid Quadrupole-Orbitrap mass spectrometer (Thermo Scientific) coupled to the UHPLC instrument to acquire spectra at 70,000 in the range of 350–1,800 m/z. The team cross-referenced proteomic data against the L. mucosae LM1 genome database. They also quantified proteins using label-free spectral counting. Xcalibur Qual Browser curated by Protein Discoverer software version 1.4 (Thermo Scientific) processed spectra of modified peptides. Using this approach, the team identified 842 proteins, which made up 35% of the 2,404 protein-coding sequences in the complete genome of L. mucosae, LM1. When the researchers quantified proteins, they detected 19 highly abundant proteins (>1.0% of the intracellular proteome), including CysK (cysteine synthase, 5.41%) and EF-Tu (elongation factor Tu, 4.91%). The authors explained that these proteins are involved in maintaining cell survival in times of environmental stress. Metabolic pathway annotation of the LM1 proteome using the Kyoto Encyclopedia of Genes and Genomes database showed that half of the proteins expressed are important for basic metabolic and biosynthetic processes. The LM1 proteome was abundant with enzymes for protein synthesis (translation, ribosomal structure and biogenesis). When the investigators compared the LM1 genome, they saw many genes involved in general functions, including replication, recombination and repair, amino acid transport, and metabolism. The team posited that cells in this phase focus primarily on regeneration of damaged intracellular components and maintenance of ribosomal integrity, since bacterial cells encounter acidic conditions pH=4.31±0.04. They also saw activated glycogen biosynthesis, which they explain is important for energy storage and maintenance. Taken together, this data help to understand the protein expression pattern of lactobacilli in standard conditions. This information is particularly helpful in host-microbe interaction models. 1. Pajarillo, E.A. (2015) “Quantitative proteogenomics and the reconstruction of the metabolic pathway in Lactobacillus mucosae LM1,” Korean Journal of Food Science of Animal Resources, 35(5) (pp. 692–702) doi: 10.5851/kosfa.2015.35.5.692.